We all want to do what’s best for out pets, but many times we miss the mark. And when it comes to quality dog food, we miss the mark more often, due to flashy advertising. We think that all of the dog foods we see at the grocery store are good for our dogs. We never think to look at the ingredients. Most dog foods found at the grocery store fall far short of actually being healthy for your dog. Sure they can live on them, even for their entire lives. But they tend to have more medical issues, and problems than if they had been fed a non-grain based, non highly processed dog food. For many years I fed my dogs commercial dog food. Purina Dog Chow was my go to food. When two of our Big Boys started having skin issues, right about the time I was also getting involved in animal rescue. I started reading up everything I could find on dogs. That included reading about dog food. And I realized I was feeding my dogs mostly corn, and other not very nutritional things. That didn’t seem right. I needed a quality dog food that was convenient. I started doing my research. And although a homemade diet is probably best for them, I needed the convenience of an already prepared quality dog food. And one that didn’t need to be shipped to me, or refrigerated. With my ever changing pack, it just makes life easier if the dog food is easily accessible. One of my rescue friends pointed me towards the Dog Food Advisor website. After going through all of the brands that were available to me locally, I finally found a 4 star brand, 4Health available at Tractor Supply, that would fit our needs. And it had no recalls listed for it in years. Five stars dog food is not readily available in our rural area, unfortunately. Wal-mart and Tractor Supply are the most prominent stores in our area, and there’s one of each in each of the towns surrounding our rural area. Pet stores such as PetSmart are hours away from me. Not exactly a quick trip to the store. 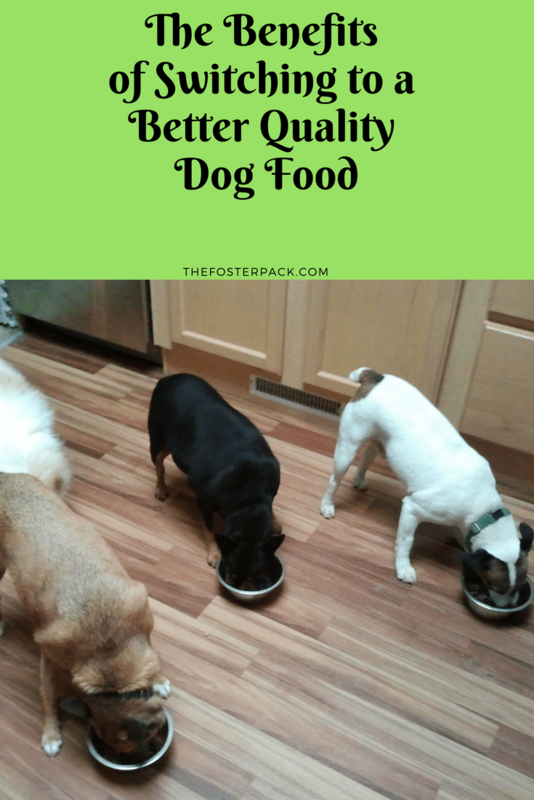 The benefits of switching to a quality dog food. But even switching from a one star dog food, to a higher quality dog food, that rated four stars, made a big difference in their lives. We alternate bags of chicken and rice, and salmon and potato. They like both flavors, but refuse to eat the lamb and rice variety. Woobie no longer needed daily allergy medicine, even in pollen season. Chewy and Ozzy’s dry flaky skin started to clear up, and they didn’t seem so itchy anymore. They all quit getting gassy, which was definitely a plus. Everyone’s coats got shinier and softer. Ozzy hasn’t had a bladder infection since we switched, and even his arthritis got somewhat better. It didn’t go away totally, but we didn’t expect food to fix that. He’s had a previous neck injury, from before we rescued him, that is the main contributor to that. Almost everyone was down to a good body score, from being slightly overweight, within one year of switching brands. We’ve been feeding the better quality dog food for five years now, and have had almost no sick dog vet appointments. We’ve had a few porcupine incident, and a few injuries. But only one sick dog visit, for cancer. It’s been almost two years now, and Chewy is doing great though. His cancer hasn’t returned, and he’s a healthy active almost 10 yr old dog. Although the better quality dog food, is a bit more expensive, it’s still quite affordable, and I believe it’s actually saved us money on vet bills. I’m a first time here and I just love you large pack! We’re a 3 dog household and mine can be rambunctious sometimes! So I tip my hat to the amazing work you’re doing with your bunch! Canine nutrition is such and important subject so it’s great that sites like Dog Food Advisor exists what with all the food and dog treat recalls over the last few years. It’s great to hear that your pack is doing so well on their new food. Thanks for raising awareness around the benefits of changing to a higher quality food! Rosemary, if you have 3 GSDs, you’re pack is probably the equivalent of mine. Ours are all ankle biters. Thanks so much for stopping by! Our dogs have been on 4Health for about 5 years now, and it’s made an incredible change in their health. Their skin and coats are better, and even some of the oldest ones arthritis has been relieved some. I just wish I had known 10 years ago about the benefits of the better quality food. Yip, they’re a busy bunch! 2 Sheps and a Shep Collie cross – I call her my limited edition pup! Nowadays it’s all about the cheapest ingredients and also where the cheapest labor is. I’m thinking specifically of those jerky treat recalled due to poison that causes organ failure. They were manufactured in China and the factory actually specializes in manufacturing plastic! When people ask me about food recommendations I always say get the best you can afford, firstly. And look for something grain free. I just checked out 4Health and saw it’s grain free. I’m a firm believer that grains cause a lot of skin problems in dogs. I’m not a canine nutritionist but I’m sure that’s why your bunch have shed their dry, flaky skins and why they are also less gassy.